Just wanted to let everyone know I have an upcoming Valentine's Class!I just love making cute little packages of sweet treats for my family and friends at Valentines. I know your kids need cute ideas for the awesome teachers in their lives, so why not join me on Friday February 8th and be ready for Valentines. You will make a total of 10 sweet treat wraps (candy not included). Need more? Just let me know at the time you sign up and add $1.00 per project to the cost of the class. Baseline cost of class is $15.00. If you have questions send an email to sandragrimes@tampabay.rr.com. Please RSVP by emailing me. As you know last week I went to Leadership. Leadership is a gathering of demonstrators from all over the world and we talk about all the upcoming Stampin' Up! products and projects. Paper Pumpkin was one of the new announcements! I am so excited about this monthly subscription to projects created by Stampin' Up! that I had to show you one of the projects. At Leadership Stampin' Up! gave all the demonstrators a free sample of the welcome kit and the Try It! Kit and last night I got a chance to complete one of the kits. I was able to make four cards with envelopes and included in the kit are two stamps an acrylic block (acrylic block will only come in the Welcome Kit and Try It Kit) and a Stampin' spot in Basic Gray. What a great value! below is more information. Run a piece of Pool Party Cardstock (3" x 5-1/2") through the Big Shot using the Honeycomb Textured Impressions Embossing Folder. Gently rub the Whisper White Craft Pad over the embossed cardstock; this will highlight the hexagon background. Adhere the piece to the 4-1/4" x 5-1/2" card using Stampin' Dimensionals. Stamp the two hearts and the flag on Whisper White Cardstock and the scalloped tag in Whisper White ink on the Primrose Petals Cardstock and cut them out using the Hearts a Flutter Framelits Dies. Use the same set of dies to cut out the Pink Pirouette tag. Stamp "just for you" in Basic Gray ink on Whisper White Cardstock and cut out a small tag piece. Punch small holes on both top corners of each banner piece. Thread the three pieces together using Whisper White Baker's twine, tie knots on the ends of the twine, and adhere the banner to the card. 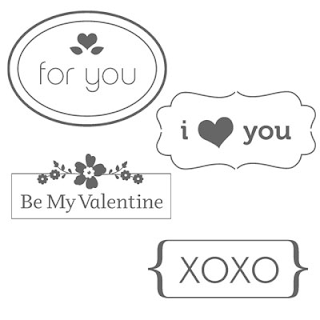 Adhere the hearts and the "just for you" tag to the banner using Stampin' Dimensionals. Tie Whisper White Baker's Twine in a bow around the heart piece from the Elements Cute Clips and attach the clip to the banner. After weeks of anticipation, it's finally here--Sale-A-Bration starts today! 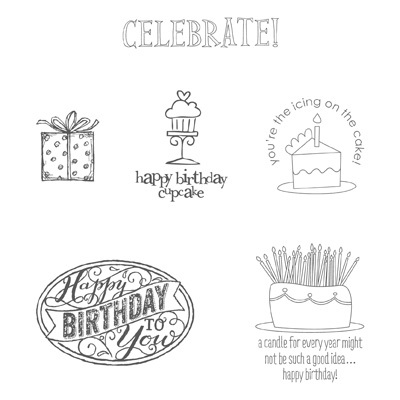 During Sale-A-Bration 2013, there are so many great offers to share, whether you want to take advantage of exclusive Sale-A-Bration products for qualifying purchases, rich hostess rewards, or an unbeatable offer when joining the Stampin' Up! family! Call me today to find out more! Here is a cute card made with one of the free sets. I just live this set! Use a takeout box pattern to create a takeout box using a piece of Primrose Petals Cardstock (8-1/2" x 11"). Fill the box with treats. Cut a strip from the More Amore Specialty Designer Series Paper (1-3/4" x 9") to wrap around the takeout box; adhere the ends together at the bottom of the box. Wrap a piece of the 7/16" Natural Trim Ribbon (24") around the takeout box and tie a bow at the top. Stamp the flag image in Pool Party ink on a piece of the Very Vanilla Cardstock (2" x 3"). Stamp "thanks" in Basic Gray over the pattern. 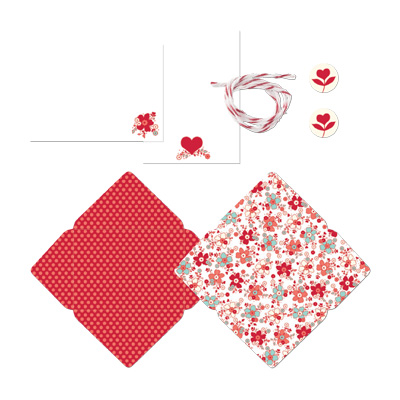 Cut out the flag using the flag piece from the Hearts a Flutter Framelits Dies. Add a heart to the flag by punching a heart from the Glimmer Paper using the Owl Punch. Punch a small hole in the top of the flag and tie the piece to the ribbon using Linen Thread. Using the Big Shot and the Petite Pocket Bigz Die, cut two pockets from the Island Indigo Cardstock. Cut off the bottom flaps. Single Stamps are back and they are Spec-Tacular!! It's so easy to get started. Simply sign up for the program starting Monday, January 14 by visiting www.mypaperpumpkin.com and click Get it or call me. Every month a new, surprise project kit arrives at your doorstep. Just think of the anticipation of creating a fun project to pin, showoff, and share with your friends and family-every month! Sign up for your monthly Paper Pumpkin starting Monday, January 14 by visiting www.mypaperpumpkin.com and click Get it. You can call me too! This card used some of the new DSP paper found in the Occasions Catalog - #129311 Tea for Two. This paper is just lovely. See below. This is a another card we completed.